Deliciously poached pears wrapped in crunchy puff pastry. Easy but impressive! For years I really didn’t care for pears. I don’t know why but as a kid the texture of pears always reminded me of wet sand (yeah, I liked to play a lot in mud when I was a kid…). At some point however I started to like pears more and more – mostly either in the form of ice-cream or baked into a cake. Extra sweetness makes fruit much more fun, right? Especially when baked, the soft pears really work well together with a bit of crunch of pastry. Texture contrasts just make food so much more interesting and enjoyable! You all know by now that I’m not the keenest baker, so why not cut out the middle man and transform the pear into an easy delicious baked dessert without all the cake hustle? Simmer some pears, wrap in puff pastry and voilà – a perfect single serving dessert. 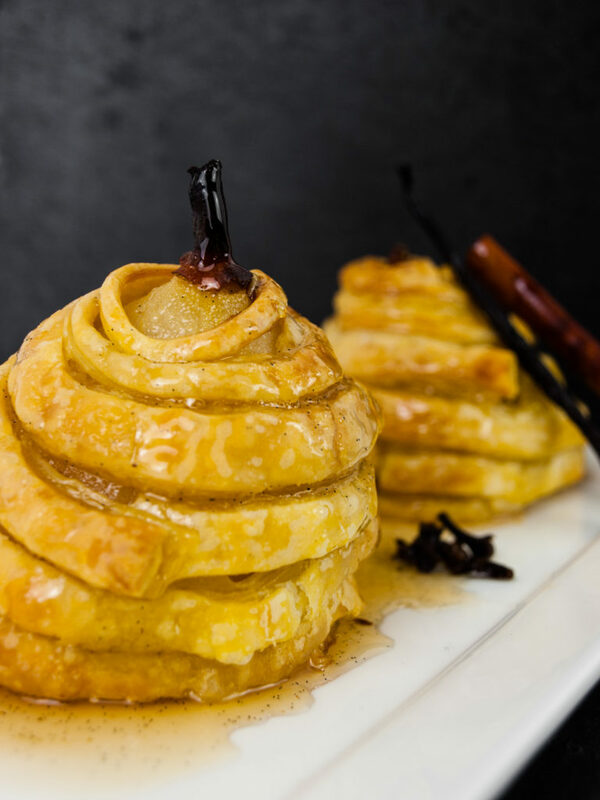 Melt-in-your mouth tender pear that has been infused with vanilla and cinnamon, layered with a thin spiral of flaky crisp puff pastry. So easy to make, so pretty to look at, even better to dig into! And come on, don’t worry about the calories, at the end of the day it is still fruit! Tell yourself that it counts as 1 of your 5-a-day! Sticky and delicious pears baked in their crispy puff pastry shell! Fetch your puff pastry sheets from the freezer, let thaw for 5 minutes and then cut into 1cm wide strips. Peel your pears, cut off the bottom so they can stand upright and remove the core from the bottom. Keep the top part with the stem intact. Put a small sauce pan on medium-high heat. Add water, sugar, honey and lemon juice. Stir to combine and bring to a simmer. Slice the vanilla bean lengthwise, scrape out the seeds and add both to the pan. Add the cinnamon and cloves as well. This is your poaching liquid. Poach your pears in the liquid for 25 minutes until they are fork tender. Remove from the pot and let cool for 5 minutes. Remove the vanilla bean husk, the cinnamon sticks and the cloves from the pot. Reserve about 300ml of the cooking liquid. You can discard the rest. Preheat your oven to 200°c (fan works best for a crunchy golden brown crust). Take a strip of pastry and start wrapping the sticky pear in a spiral motion. Wet the end of the pastry strip with a drip of the cooking liquid and press the beginning of the next pastry strip onto it, so they stick together. Keep wrapping the pear until you reach the top. Tuck in the end of the pastry. Bake for 15-20 minutes in the pre-heated oven until golden brown and crispy. While the pears bake in the oven, bring your remaining poaching liquid on to the boil on medium-high heat and let it evaporate until it becomes thick honey-like syrup. Stir occasionally. Drizzle your baked puff pastry pears with the syrup and serve immediately! Let us know what you think about the recipe in the comments below! Did you ever make poached pears before and would you add anything else to the cooking liquid? Think the recipe is missing something that would make it even better? (A scoop of vanilla ice-cream comes to mind!!) Comment below and let’s make this recipe even better together! Previous Post Just having the best time in Porto, Portugal!